There exists a physical edge between two worlds that, standing side-by-side, ignore each other. One of these worlds is the rural, which would be incorrect to describe as a natural world. In the Île-de-France region surrounding Paris, this world corresponds more often than not to agricultural lands that have been consolidated to allow for large-scale mechanized farming: human deserts visited four times a year, impoverished through the disappearance of the hedges, ditches, groves, and paths the reallotment process has succeeded in erasing. The other world, urban, corresponds to the periphery of the periphery. It is an unstable, shifting world. It is a world made up of residential areas, commercial zones, business and industrial parks, all turning their backs on the agricultural world while nonetheless remaining at a distance from the urban realm, lacking its shared and frequented public spaces. This edge joins two marginal worlds of little quality, a situation with the appearance of a common catastrophe. There is neither confrontation nor recognition between them. They both turn their backs on one another. This edge is most often marked by simple fencing, through which no connection or exchange is established from either side: they share nothing more than this state of being on the fringe. Only an artifice can repair this unacceptable situation. Only the invention of a very particular kind of space can begin to reverse it. From neither of the bordering worlds should a model be taken. 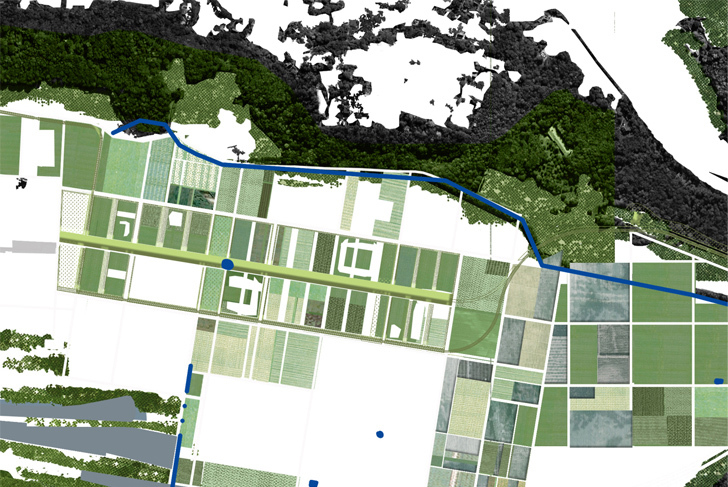 Wishing to recreate the pre-existing agricultural landscapes would be specious. Wishing to transplant small urban parks to these outskirts would only renew indifference to the situation. For allowing this border edge to continue to shift and move, accepting the whittling away of the countryside by the encroachment of the urban margins, would only serve to bring about further wastefulness, and prevent us from taking advantage of a situation that is in many respects exceptional. Indeed on the contrary, it is necessary to firmly determine and fix this edge. It is necessary not only for the protection of the city’s surrounding agricultural lands (which in doing so maintains the proximity between the spheres of production and consumption) but for curbing an expansion that would generate the further disappearance of value and meaning. Rather, these two worlds should merge together through the articulation of a wholly separate and unique environment, one which reconciles themand renders their relationship mutual. The thin and fragile line separating these worlds should be widened, allowing for a thickness and existence in which each world can benefit from the other and utilize the qualities of the other. Open connections need to be created, a porosity established, rather than a belt of restraint which, whether it be green or not, equates to little more than the expansion of a fence. This environment should both make use of practices and techniques borrowed from the world of agriculture, as well as compensate for the deficiencies present in the urban periphery. The first requirement brings to mind orchards, vegetable gardens, and truck and marsh farming, while the second calls for public pathways and practices. It is less a matter of creating a utopian and picturesque countryside than of reconciling practices and usages lacking in each of these two worlds. The maintenance of this novel landscape typology, at the crossroads of experimentation, leisure, and farming, differs as much from that of productive agriculture as from that provided by public service departments for roads, parks and gardens . It is an upkeep to be divided among municipalities and farmers, private concessionaires and public proprietors. To the large repertory of practices to which this landscape opens itself to, there corresponds a large variety of urban and human geographical circumstances, implying that its implementation needs to take place on a case by case basis. The continuous band which replaces the line gains in variety. It expands and swells more or less at the mercy of what it comes across. It requires the invention of specific solutions, with a particular vocabulary. Putting such a practice into place requires governance. An “edge law” should be conceived based on the 2005 law which aimed at the protection of peri-urban agricultural and natural areas, modeled in turn on the 1986 French Coastal law. Such a law would allow the establishment of a clear perimeter. Its application would take place through the setting up of specific guidelines determining usages and conditions of usage, and allowing in this way for a subtle adjustment in the relationship between the two worlds, specifying how they should open themselves to one another. Concessions, partnerships, and mutual assistance should be imagined... What it amounts to is the creation of a policy accompanied by physical results. These results are determined by the invention of a landscape which will be at once continuous and highly diverse, a seam offering new horizons. Facing the city, it marks an opening and the end of a boundary. As public space, it establishes connections, bringing an end to camp logic. Its simple existence has profound effects. Dead end streets lead to shared spaces, completely altering the status of public street with private usage. Facing the countryside, the same type of expansion applied at the boundary between two private estates without paths, creates a vital network allowing accessibility to these “urban fields”, multiplying the opportunities for invention. The instruments are thus simple and few. They can be quickly put into place. The opportunity is thereand the results would be enormous if one considers the extent of these border edges. Within the Parisian urban agglomeration, there are two kinds of edges to take into consideration. There are situations of enclave, where fields, as well as woodlands and forests, are completely surrounded by constructed areas. It is of course necessary to protect these areas, but also necessary to know how to render them accessible: it is an invitation to imagine the continuities and corridors which the landscape often already supplies. And then this outer contour,with the framework of an exoskeleton, a contour of agglomeration, can spread out its branches until coming to a stop at the rural continuum. The interaction here created between these two worlds thus fixes and stabilizes one of the major characteristics of the capital's agglomeration, combining these worlds very close to the urban center. It also provides a means of approach. Above all, it reconciles these two worlds made up of unequal strengths by establishing communal forms of development and local economic exchanges, by encouraging the mixing together of cultures. It aims at repairing unfavorable or abandoned situations, turning perceived handicaps into assets. Never content to simply protect natural resources, such an approach seeks to animate and amplify them. Taken together, these benefits attest to the spirit of sustainable development, far from the incantations and shaming with which it is too often surrounded.